Leon Panetta has served as a member of the House, Chief of Staff to a President, Director of the CIA and Secretary of Defense. But it all started with a law degree. 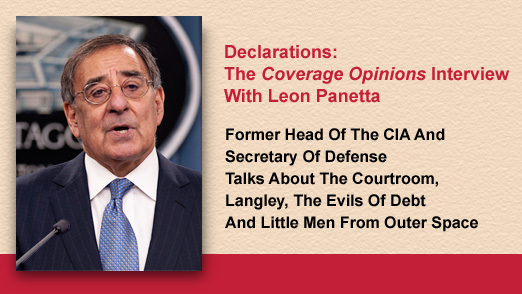 I spoke to Secretary Panetta about his remarkable career and time as a lawyer. Oh, and, by the way, would the nation's former top spy tell me if there are aliens at Area 51? You've no doubt seen the new Esurance television campaign where Dennis Quaid discusses the benefits of purchasing the company's insurance. 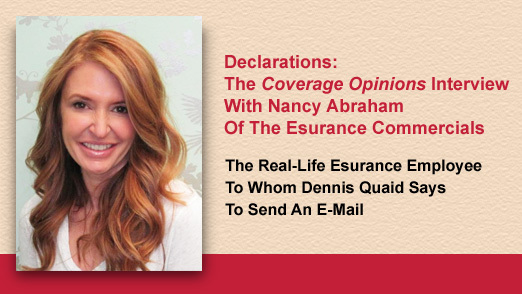 Quaid ends one commercial by saying that, if you don't believe him, you can believe this Esurance employee who he introduces, Nancy Abraham. He invites viewers to send her an email at Nancy@esurance.com. Of course I did. Belated Happy Mardi Gras: Appeals Court Interprets The "Coconut Exclusion"
Fill In Your Insurance Coverage Bracket: 64 Coverage Issues – Which Is The Most Interesting? Alaska High Court And A Lawyer's Advice On Dealing With A Bad Faith "Set-Up"